We had the juicy pleasure of meeting Anna and Jordan from My Kitchen Rules at a recent Coles cooking demonstration whilst we were offering free tastings of our new season Navels in store. 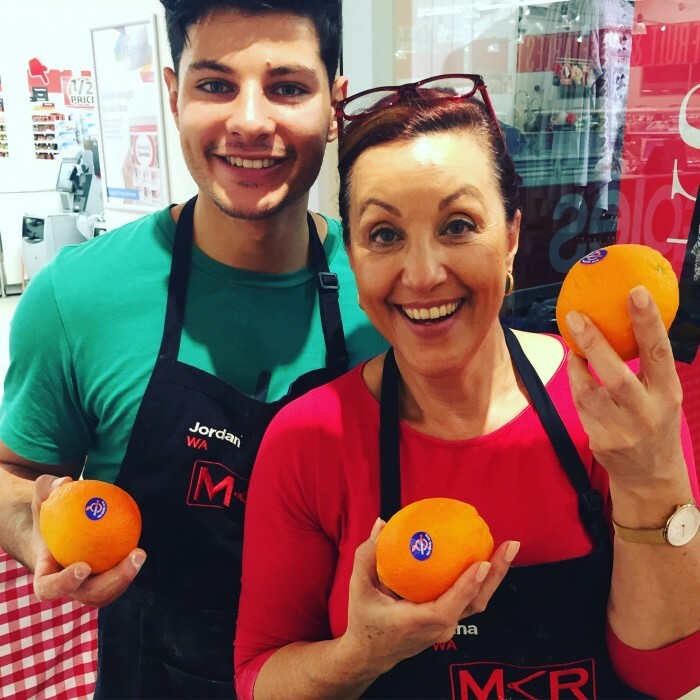 We popped over to try some of their homemade Crostoli and we tickled pink (or rather, orange) to see that they had Moora Citrus in their fruit bowl and in their recipe! Anna and Jordan loved our locally grown Navels so much that they were more than happy to pose for a happysnap. After posting this picture to our Facebook and Instagram pages, Anna got in contact to share with us their citrus-inspired homemade Crostoli recipe. And here it is! Sift flours together and sugar; make well and place remaining ingredients in centre and incorporate. Should form a smooth ball; wrap in plastic, rest for a minimum of one hour, more if possible. Roll out to desired thickness, (I use my pasta machine). Cut into two centimetre strips and deep fry in rice bran oil and dust with icing mixture.